I will be the first to admit that the choice of products and brands in the beauty market can be overwhelming and it is becoming increasingly difficult for the consumer to make the right choice for themselves. To buy products not on a whim, not because it is advertised on TV or pitched by the press but to make an educated choice, to find a brand or brands that will help to make a woman or man look like the best version of themselves, correct the imperfections, address the problems and let the skin shine…. A lot of us also often make the choice based on the looks of the product or its packaging or a sales pitch, only to realise shortly thereafter that it doesn’t deliver or work for our skin type. The old saying remains true, don’t judge the book by its cover and I nearly made that mistake recently by not paying close attention. 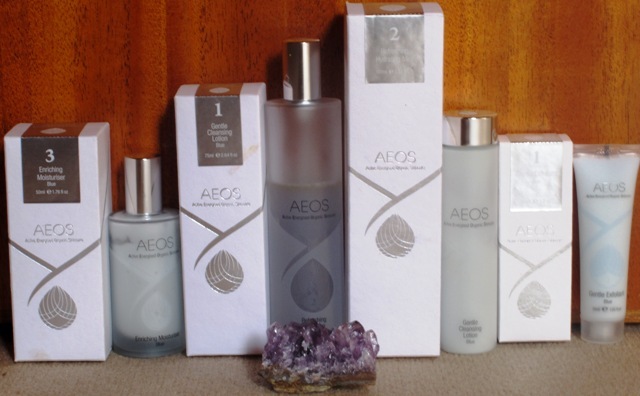 And what a mistake I could have made – welcome to the spotlight-AEOS ( Active Energised Organic Skincare ). This organic brand has been on my beauty radar for a few months, I heard a few positive remarks and even popped by their fantastic stand at the Natural and Organic Show earlier in the year, but unfortunately the staff was busy and I didn’t get to ask any of my endless questions. I exchanged a few tweets with the brand and in early September, after I was asked a few questions about my skin ( smart brands, please take notice, that is how you build up the relationship with the consumer ), I was sent four products to try, all Blue: Gentle Cleansing Lotion, Gentle Exfoliant, Refreshing Hydrating Mist and Enriching Moisturiser. Before I talk about each product in more detail, based on using them for well over a month, let me tell you a little about this organic brand with a difference first. AEOS is an advanced organic skincare brand that combines ingredients from the realms of plants world, minerals, colour and light. Intrigued? I thought you would be! Ingredients have been sourced from the soil that has been nourished and activated and not used and re-used again and again. A good farmer will always allow the soil to ‘rest’ at some stage, otherwise it gets depleted and so will the quality of produce. AEOS team made a conscious choice to use the best raw materials and one of the things that you have to remember is that each of their products needs to be ‘shaken’ gently before each use, in order for the optimum efficiency of the synergy of ingredients. The company also uses a unique energizing process ( see, we are all reminded a little bit of physics and chemistry that most of us forgot since leaving school )-in order to activate the products for the ultimate benefit of the user. Mike Booth, the owner/founder of Aura-Soma (the manufacturer of AEOS products & a company at the cutting edge of Colour Therapeutics in the world), has been working in the cosmetics industry for the last 30 years, prior to which he did an extensive study of plant materials, crystals and gems in relation to the healing potentials contained within them. Mike studied homeopathic and other therapeutic modalities, before becoming the Owner/ Chairman of Aura-Soma. He is also a musician, an artist and a lecturer who travels around the world. A while back Mike inherited many formulates from an apothecary of the ancient tradition, Vicky Wall, whose wish was to see these formulations actualized in current times, using bio-dynamic and organic ingredients where possible. Most of the ingredients of AEOS products are grown on Shire Farm, which is bio-dynamic Demeter certified and others are sourced from around the world from organic or bio-dynamic farms. When plants are cultivated on farms like that, they have more vitality and ultimately this gets transferred to you, the consumer, thus the brand’s core philosophy of ‘look after the soil, feed the skin, nourish the soul’. All AEOS products are designed to be kept below 30C and are already sold and used in countries around the world (from England to Australia, from Japan to Russia). Although the climates are different, the products retain its quality and intention and the team (small but mightily united) receives regular feedback from customers on how AEOS has helped bring about a positive change to their complexion and daily life. AEOS was launched with the core skincare range of 11 face products, which form part of the phase three system of three Rs ( renewal, rebalance, replenish ) that includes tinctures of crystal energies together with waveforms of colour ( you have blue, yellow and pink products depending on your skin type ) thus allowing you to nourish not just your skin, but your mind in a more profound way. In our day and age, when we are daily exposed to city pollution, sun, working in the air-conditioned offices and other environmental aggressors, it’s becoming a trickier task to maintain the health of the skin, so AEOS helps you to restore the balance in your skin and protecting your skin when it needs to be. You can have a quick cleanse/hydrate/moisturise routine when you are doing things in a hurry or a longer, more nurturing ‘skin booster’ treatment in the evening, when you can add a serum or scrub for example. AEOS Gentle Cleansing Lotion, 75 mls, £49.99: this very gently and creamy cleanser is a combination of organic and bio-dynamic essential oils, plant extracts, energies of gems and crystals, all of which make removal of make-up and daily impurities an almost meditative experience. The formula is very gentle and moisturising to start with-another thing to remember about AEOS products is that you only need a little bit at a time. You apply the lotion, spreading it with your fingers, massaging it into your skin and facial contours. Then you add a little bit of water that helps to activate plant extracts and fruit oils even further. You need to apply this lotion to a slightly damp face to start with and when you add a little bit of water make sure it’s not hot or cold, but luke-warm and the lotion will leave your skin beautifully clean and well-moisturised. Its blue colour is derived from blue camomile flowers and it is enhanced by the inclusion of crystal essences of Rose Quartz, Quartz, Blue Chalcedony, Blue Sapphire, Amethyst and Turquoise. I know practitioners who infuse their oils with a specific crystal for a period of time, before bottling it but AEOS takes the power of crystals on a different, more powerful level as each crystal essence has its own unique quality and helps to change your energy particles. You also have Spelt, Sweet Almond, Jojoba, Rose Hip, Argan, Rose and Grapefruit oils, as well as extracts of Lavender, Rose, Chamomile and Arnica that make the lotion both calming and balancing. When you apply it to your face, it smells of flowers and makes you inhale and exhale fully, a lovely reminder of how enjoyable and invigorating breathing can be. The lotion comes in a small bottle with a twist cap at the top but I got a little annoyed with it, as I had to put some squeezing effort into it when the bottle became half-full and if I turned it and put it down on its ‘head’, then it leaves was some lotion residue on the glass shelf, as when you twist close the cap it squeezes a little bit of the product out. That’s not a criticism but my own little observation. AEOS Gentle Exfoliant (Blue), 30 mls, £35.98: on those days when you feel that you skin needs an extra radiance boost, use this product. Unlike many scrubs it isnt’t too soft and or too rough-it is just gently effective-the only way I can describe it. It looks and feels like a creamy lotion, yet it contains grains that massage your skin, as well as help to get shift dead skin cells as you massage it in. Its lavender scent relaxes you and makes the process almost meditative in its beauty of revelation. You can use this scrub either in the morning or evening but how often should be determined by your skin type. If your skin is mature, use it once a week, if your have normal/dry/sensitive skin, you can use it twice a week and if you have combination or oily skin, you can use it up to three times a week but not more. All AEOS products should be applied to slightly damp skin for maximum benefit and if you try to do it on dry skin, you will see a subtle difference. This exfoliant actually leaves your skin receptive to moisturising because it is rich in seed oils and it is only enhanced when you use a face mist followed by serum or moisturiser straight after. Key ingredients of this exfoliant come from nourishing Spelt oil as well as Jojoba, Hazelnut, Avocado, Argan, Sweet Almond, Lemon Myrtle and Lavender oils plus Rosewater and Calendula Extract. A 30mls size of this exfoliant makes it very handy for travel, even when you are going away for a few weeks and I find it to be a really effective skin scrub when used over time. AEOS Refreshing Hydrating Mist, 100 mls, £54.99: to be honest until recently I only could name one facial mist that I dearly loved that stood the test of time (or rather quite a few years) but this mist offers such a delicately subtle hydration that my hand goes to it again and again in the course of the day, when I am typing furiously on my laptop or Mac. It seamlessly blends organic and bio-dynamic essential oils with plant extracts and gem and crystal energies and hydrates your face, like a delicate dew on the flower leaves early in the morning (thanks to the fruit and flower hydrosols that not only refresh your skin, but balance it as well). And by the way, now is a perfect time to start using a toning mist again, especially if you don’t use a humidifier in your home. You shake the bottle vigorously and then spray it a few times over you face and neck, if you feel like it, while inhaling its beautiful aroma. Do it after cleansing and after exfoliating and you will enjoy the heightened sensation of moisture on your skin (or spritz yourself when tired or sitting next to a radiator or at your office desk), as well as the product absorption into the next skin layer. The colour blue of this refreshing mist is derived from gardenias. The mist itself combines crystal essences of Opal, Amethyst, Charoite, Turquoise, Emerald, Quartz and Chrysoprase. In terms of key organic and biodynamic ingredients you get Rosewater, Lavender and Orange Extracts and Lemon Myrtle and Spelt Oils. While a 100 mls glass bottle might not be ideal for your hand or shoulder bag, it fits very comfortably into the palm of your hand and looks as beautiful on the bathroom shelf, as it does on your work desk. AEOS Enriching Moisturiser (Blue), 50 mls, £58.99: this moisturiser is your ‘final frontier’ of sorts, as it helps to seal in all the moisture, replenishes the skin and supports regeneration process in your epidermis. It feels silky on your skin and makes for a great canvas for make-up with no need for primer. It feels quite rich but sinks into the skin almost immediately, leaving no oilines or residue and a faint smell of flowers on your skin. It lifts tired skin or skin that is exposed to office air-conditioning and my one and only small grumble here is that the pump comes too close to the neck of the bottle when pumped, so you have to wipe a little bit of the product off the bottle’s neck, unless you pump it out at a small angle. The crystal essences list is absolutely dreamy here and includes Rose Quartz, Topaz, Orange Calcite, Amethyst, Blue Chalcedony, Blue Sapphire and Turquoise. Mix it with Spelt, Jojoba, Sweet Almond, Argan, Sweet Orange, Lemon Myrtle, Lemon Tea Tree and Lavender Oils, add some Rosewater, Lavender, Chamomile and Arnica Extract and you are in beauty heaven. Mike’s desire is for AEOS to make a difference in the world and he is committed to focussing on the premium ingredients that go in to the product, rather than investing in unnecessary marketing and superfluous packaging. When I asked him about where he sees AEOS as a brand in the future, he replied that he would like to achieve a global presence of users, who appreciate the unique quality of AEOS products and understand the depth of difference within the quality and intention of the products. The truth is this: I can’t name many skincare brands where I love the whole range of products and not just the select few and AEOS is now one of those brands for me, after using its products religiously for over six weeks. I know that their products and regime lead to skin ‘perfection’. I started noticing subtle differences in my skin after just two weeks use and within four people started telling me that my skin looked fresh and radiant. I had compliments from facialists, saying that I had beautiful skin and I could actually see for myself in the mirror that my skin was clear, with no blemish or imperfection in sight. If that is not a result we all want, tell me what other requests you might have. P.s since I started using AEOS products on my face, I also tried their trio of bodycare products, namely Beauty Body Shower, Beauty Body Lotion (awakening) and Beauty Body Lotion (harmonising). Beauty Body Shower, 75 mls, £10.99: is very gentle on your skin and contains a subtly potent blend of rosemary, white birch (Russians love using birch branches in the banya, as it reinvigorates the skin and birch trees also produce juice that is as clear as morning dew) and gardenia. You only need to squeeze a little bit of the product into the palm of your hand, add some water and spread it all over your body-before you squeeze the product out, don’t forget to shake the bottle, like your bootie on the dance floor, to make sure that the ingredients will be at its maximum potency. When you will come out of the shower you will feel clean-imagine the same sensation of laying down on the perfectly crisp white sheets and inhaling the air in. Beauty Body Lotion (awakening), 75 mls, £35.98: it is a soothing, rich lotion that derives its yellow colour from calendula extract, one of my favourite plants. It hydrates and soothes the skin, as well as awakes your senses with a strong flowery fragrance in the morning. The best way to use it is to apply to slightly dump skin in order to lock in the moisture and don’t forget to shake it up and down in your hand prior to use. You will benefit from oils derived from Spelt, Jojoba, Arga, Grape seed, Rose Geranium, Rose, Calendula, Lemon Myrtle and Ylang Ylang with the added benefit of lavender and calendula extract and crystal essences of Opal, Zincite, Fire Opal, Quartz, Carnelian and Orange Calcite. Beauty Body Lotion (harmonizing), 75 mls, £35.98: I tend to use this lotion in the evening, but the best thing to do is apply it to your skin and see how it makes you feel emotionally and then decide what’s the best time of the day for you to use it. This lotion contains Blue Lake Agate, Amethyst, Sapphire, Charoite, Emerald, Turquoise and Quartz crystal essences. It has the same ingredients as the Awakening lotion but this one smells somewhat more subdued, more calming on your senses. An important thing to remember is that you only need a little bit of the product to start with and even though the lotion comes in a 75 ml bottle, the bottle will last you a while due to its concentration and beautifully rich formula. I was a little curious as to why two body lotions smell very similar to each other, while one is better suited for morning and another at night time and was told by Mike that the difference primarily lies in the combination of spagyrik tinctures of crystals and gems that are added to each of the two different Body Lotions (Harmonising Body Lotion contains crystal essences of Blue Lake Agate, Amethyst, Sapphire, Charoite, Emerald, Turquoise, Quartz; whereas the Awakening Body Lotion contains crystal essences of Opal, Fire Opal, Zincite, Quartz, Carnelian, Orange Calcite).